The seventh day of the 2019 CaptiveOne U.S. Open Polo Championship® featured an exciting opening game with Pilot narrowly defeating Tonkawa 11-10 to remain undefeated, while Postage Stamp Farm overwhelmed Stable Door Polo in the 13-8 victory at the International Polo Club Palm Beach. A back and forth affair between Pilot and Tonkawa saw both teams generate offense in different ways, with Tonkawa holding the advantage in open play, while Pilot dominated the penalty line. Using a high-pressure defence, Tonkawa tried to limit the time and space of Facundo and Gonzalito Pieres, holding them to five combined field goals, but the rest was a high foul count, where Pilot was efficient from the line, converting 5 of their 7 attempts. The early stages of the game displayed a fast pace for both teams, with Gonzalito Pieres leading the way with two early goals for Pilot. Tonkawa responded, led by Agustin Merlos who was active on the attack throughout the game, but the fouls began to increase, resulting in two penalty goals for Pilot and keeping Tonkawa trailing by a goal at halftime. 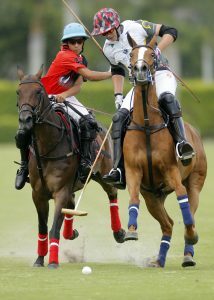 The second half produced even polo for both teams, trading goals back and forth as Pilot’s lead continued to stay at just one goal. Scoring a penalty goal in each of the final five chukkas, Pilot was able to overcome a strong open play attack from Tonkawa. Sapo Caset tied the game at 9-9 in the final chukker with his fourth goal of the game, but Pilot quickly responded with two goals in quick succession to seal the victory and improve to a perfect 12-0 on the season. 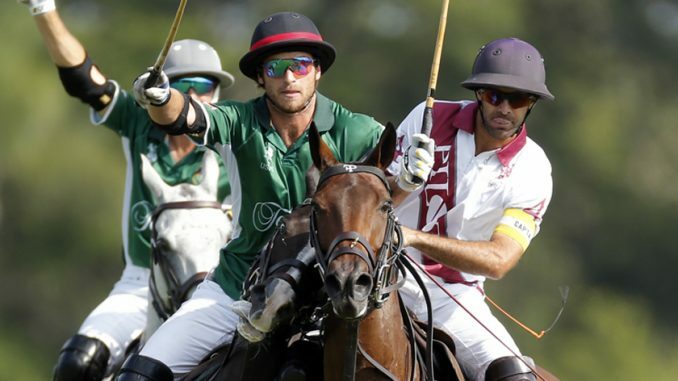 The second game of the day displayed an impressive performance from Postage Stamp Farm behind the duo of Mariano Aguerre and Lerin Zubiaurre. Combining for 11 goals in the game, the duo produced a variety of runs and passes that provided difficulties for the Stable Door Polo defence. Fighting for each scoring opportunity, Stable Door Polo was unable to take advantage of their chances, finishing just 36% of their shot attempts in the defeat. Aguerre exploded for three goals in the opening chukka on perfect 3 for 3 shooting to begin a Postage Stamp Farm attack that carried over into the rest of the first half. Completing the half with three goals and two assists, Zubiaurre pushed Postage Stamp Farm into the commanding 8-3 lead, while Santiago Toccalino was the lone scorer for Stable Door Polo. A brief opportunity to mount a comeback presented itself to Stable Door Polo to begin the second half after foul trouble provided Toccalino with three penalty attempts. Despite converting two of the three attempts, Stable Door Polo only reduced the deficit by one and then failed to score in the fifth chukker, sealing their fate against an organized Postage Stamp Farm team. Zubiaurre finished with an impressive six goals and three assists to lead Postage Stamp Farm to the convincing 13-8 victory.